We have a copy of Brentford Through Time to give away to the first registered member of BrentfordTW8.com who can tell us what year the tolls over Kew Bridge were abolished? Brentford Through Time can be bought from publishers Amberley here or via Amazon. Brentford was once one of the most important towns in Middlesex with its own market and fair. Its position on the main road leading to the west of England and at the junction of the Thames and the Grand Union Canal helped it to become a thriving industrial centre with breweries, soap works, tanneries, boat builders, a gasworks and a waterworks. In the 1930s Art Deco factories were built on the new Great West Road. Most of these have now been replaced and industry has largely departed from Brentford town centre. Old shops and houses have been demolished and more buildings are due to be replaced to transform Brentford into a modern riverside suburb. Using old illustrations and modern photographs, this book attempts to convey something of the flavour of both the gritty old town that was Brentford and its present day counterpart. 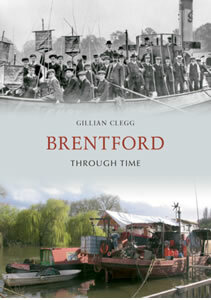 Gillian Clegg’s involvement with Brentford began back in the early 1970’s when she was one of the volunteer archaeologists excavating sites in Brentford prior to their redevelopment. She worked for many years as a magazine editor and writer. She edited the Brentford and Chiswick Local History Journal for over ten years and is the author of several local history books including Brentford Past, The Archaeology of Hounslow and Brentford and Chiswick Pubs.